Francesa's February take that Tony Bennett will "never win a championship with this team, though. They can't play offense" particularly stands out. The Virginia Cavaliers picked up the NCAA men’s basketball national championship Monday night with an 85-77 overtime win against the Texas Tech Red Raiders, and that win wound up proving a lot of very confident sports pundits wrong. This tournament came a year after Virginia became the first-ever #1 seed to lose to a #16 seed (the UMBC Golden Retrievers), and that loss in particular sparked a lot of hot takes on coach Tony Bennett, his defensive system, and the Cavaliers’ program as a whole. And the takes didn’t stop there, rolling on into this tournament, during this tournament, and even just ahead of this title game. The loss that ended Virginia’s season at 31-3 leaves one question that must be addressed. Is Bennett an expert at building teams for the long haul of the ACC season, but less so in preparing a team for the short haul of the highly pressurized NCAA tournament? With each piece of additional evidence, it’s difficult to draw any other conclusion. Now, the Cavaliers are in the record book for the wrong reason. They’re being bashed by columnists and talk-show hosts who insist they’re better built for the four-month grind of a regular season than the do-or-die, single-elimination NCAA tournament. And given Bennett’s recent track record (143 wins over the past five seasons, but no Final Fours), it’s hard to argue. That loss also led to a Change.org petition to fire Bennett, which only had 11 signatures as of Tuesday. But there were also pieces from The Ringer to Deadspin to FanSided pointing out that Virginia’s focus on defense and a slow tempo made them perhaps more susceptible to upsets than the average team, with all wondering to some degree about the merits of Bennett’s system. And while it’s probably true that a slow-paced system can increase the potential for upsets if your shots don’t fall and if you’re matched up against a hot three-point shooting team like UMBC, that doesn’t invalidate the overall system. Virginia has been called boring by some, including Stephen A. Smith, who said he hopes the Cavaliers lose in the first round of the tournament so that they “won’t ruin games” for the rest of the tournament. Well, maybe Smith should go watch the Knicks and tell us how much fun he’s having. 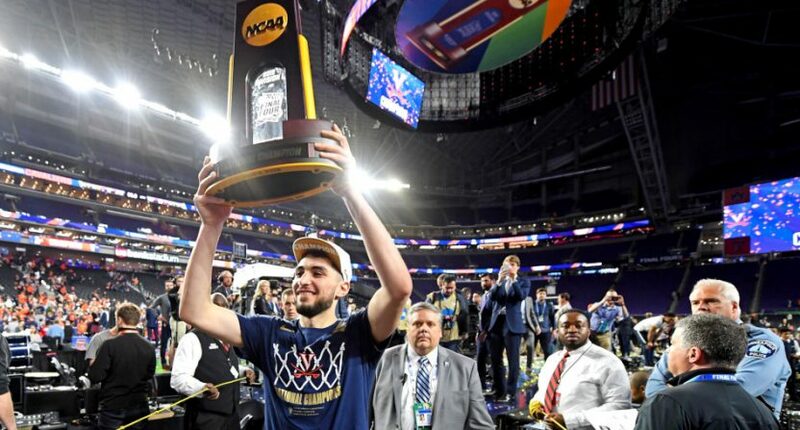 Smith also got delightfully called out by the Cavaliers’ Ty Jerome (seen above with the trophy) Tuesday after their championship win.